Love to kayak? If you haven’t heard, so does Russell Crowe. But the Oscar-winner ran into some trouble this weekend on a kayaking day trip off Long Island. 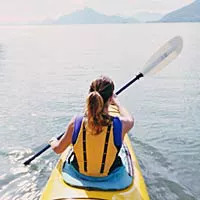 We asked Jessica Matthews, an exercise physiologist and spokesperson for the American Council on Exercise (also an avid kayaker), to give us the lowdown on kayak safety. Love to kayak? If you haven’t heard, so does Russell Crowe. But the Oscar-winner ran into some trouble this weekend on a kayaking day trip off Long Island. He and a friend were out on the water past sundown, 10 miles from their starting point, and had to kayak to shore and get picked up on the beach by the U.S. Coastguard. While the seasoned kayakers claimed they weren’t lost (Crowe tweeted: “not lost, we knew where exactly where we were, paddling around from csh into wind, we ran out of day”) the incident made us wonder--how can we prevent a similar mishap, especially as it turns to fall and the weather gets more unpredictable? It’s important to look on your local surf-report website to check the water conditions for the day. “That’s because sometimes the water may look calm from the shore, but may actually be choppy further out,” says Matthews. Surf reports also include the high and low tides, and when the sun will set (which would have been helpful for Crowe). While Crowe used his booming voice to get the attention of the coast guard, not all of us have the pipes. Matthews recommends keeping a “dry bag” on your kayak with a whistle to get someone's attention, as well as a sturdy rope (in case a fellow kayaker needs to be towed), and even a cell phone so you can call someone if you run into trouble (put it in a water-proof bag, so it doesn't get wet). Also bring some snacks, an electrolyte drink, and a change of clothes, says Matthews. “The way you sit in a kayak--with your legs stretched out--can sometimes cause leg cramps,” says Matthews. She recommends doing a few warm ups before you start (like the cat-cow yoga pose, leg swings, and arm circles). Then, if you’re ever in shallow, calm water, see if you can jump in and swim around your kayak to stretch out. Or, you could even take a break and dock your kayak and walk around for a bit before hopping back in, Matthews suggests. You may know when the sun is setting (by checking those surf reports), but if you don’t have a watch, it won’t do much good. Head back to shore before the exact time the sun is supposed to set, says Matthews, because you never know if the wind or currents will pick up, causing it to take longer to get back. Crowe and his friend were wise enough to wear their vests, and you should always do the same, says Matthews. Also a good idea: Practice the buddy system and ask a friend to join you; someone should have your back in case anything goes wrong.